Joran Fayara looked upon his master, as she spoke with a dissonance never before seen to him. She hissed like a snake, every word rolled into the next with greater contempt. He had not seen her in many cycles, and he had been left to himself at the Jedi Temple of Dantooine. Master Tiana Bril was an Iktotchi female who earnt her reputation and prestige during the Imperium Wars. On a morning Joran would have rather forgotten, an encoded transmission reached his comm-link in binary, telling him to travel to the far wastes of the frozen planet of Vandor-1. There, he found only an igloo among a valley of endless white snow. It stood out like a sore thumb, the light of a fire and the Force emanating from it. Like a lonely house, the igloo gave off a chill of discomfort, Joran’s fighter landing briskly in the snow. Joran himself was filled with hope, for he thought his master dead. He called out for her, “Master!”, over the harsh winds of an oncoming blizzard. Each howl of the air burnt at the fibres of his soft, white skin, snow tangling in his fiery ginger hair. 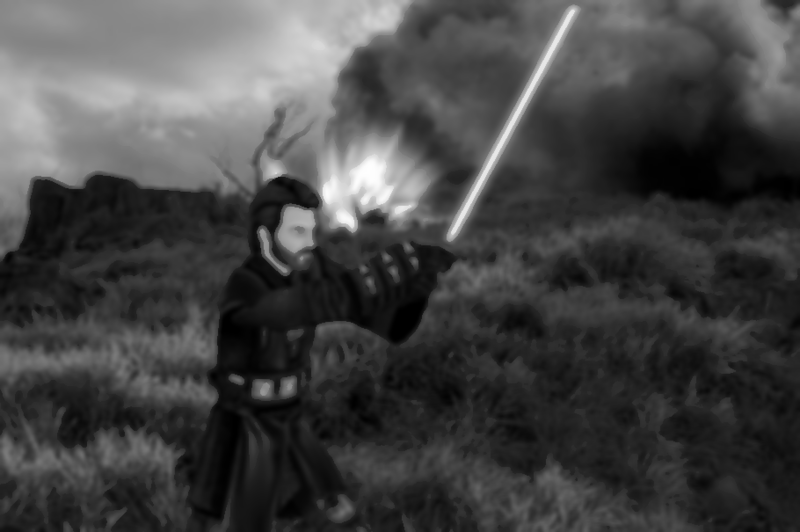 “Master!” He called out again, until he felt a tremor in the Force; as if an awakening had occurred. Within the limited, small confines of the igloo, a protruding resonance of the Force seemed to pour out. Joran trudged through the squelching wet snow that felt to be quicksand under his feet, lunging with each footstep to reach the confines of the igloo. From within a fire crackled and charred like a burning display of fireworks; and on the far end, sat his Master on a blanket, her face thin, withered and worn. “Master. I am so glad you are alive.” He reached out with impassioned words, only to receive a sullen glare from the motherly figure he had known for over a decade. Her eyes had adopted something which only brought a yellow glare to them. It was at that time, which he noticed the glimmer of a holocron at her crossed feet and legs, on the rug which she sat. Her eyes only turned down to the Holocron. She tilted her head as if to listen to it, silent whispers unheard by Joran’s naïveté, only filled with the relief of finding his mentor. The light of the fire began to die, and with it the light on their faces dissipated. No longer did the fire’s shadows play on the walls of the igloo, and all fell silent for only a moment. “I was attacked. My assignment brought me this.” She said with reluctance, something rumbling within her. The Holocron seemed to dazzle with a fluorescent, unearthly light once she referenced it, Joran feeling an unnatural emanation of the Force which tied between them. His spirit began to dwindle, and a fearful doubt entered his mind. “It has kept me alive, and I, it.” She continued, caressing its metallic corners. “What is it, Master?” Joran asked with a lump in his throat. She stood, slowly, her eyes returning to Joran in an instance. “You know, there is no great revelation, no great secret; and above all, there is no great truth. There is the Force, and with it, our naïve interpretations of its unfathomable nature. I was born through fire and flame, in a world wrought with the destruction of my home; and in that, I had thought to find something true – a belief I found certain. Invisible whispers began to fill the igloo, which felt to constitute Joran’s world. Nothing outside of the igloo mattered, and only his master’s hissing, hateful voice filled it. He stood, silent, so stunned at the change of his Master’s spirit to not even remain alert enough to have a hand on his Lightsaber’s hilt. “I know you are cold, and hungry Master… but you are not thinking straight – it has been… over a year that you have been here. Please Master, let me take you home. It hurts me to see you this way, when once you filled me with such hope.” He reached out for her in an apprentice’s voice. Master Bril’s work had subjected her to the temptations of the Dark Side ever since the Imperium Wars, but Joran knew her to be of tolerant spirit and fortitude. To see her crack, her understanding of the Force to have been so shattered; it ripped at his heart, and he felt a conflict within himself. “The pain of the Force.” She held the Holocron tightly, as if to draw power from it. “The Force is life, Master, you cannot destroy it. And why would you? Because in the same way it gives life, it takes it away?” He said with a fearful doubt. She spoke in a voice that was not hers. “…they are of no consequence.” The blade hissed to life in her hands and lit up her once dark face in a red hue. All that he saw were her eyes, as crimson as the blade itself. What ensued was a blur, a frenzy of multicoloured light. The claustrophobic igloo was melted away by redirected red and blue blades, until only Joran stood, wet of melted ice and sweat.